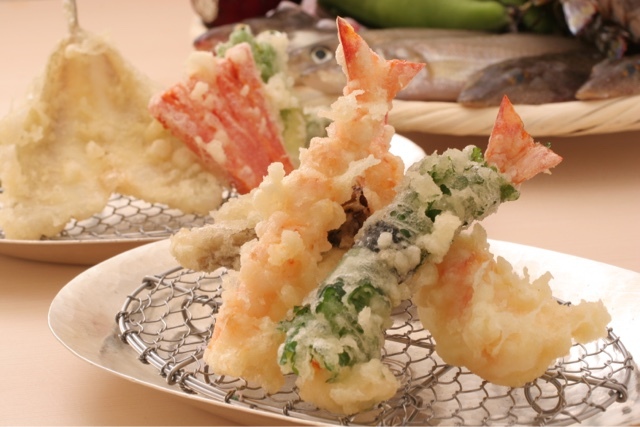 Tendon (tempura served in a bowl on rice) popularized by affordable restaurants has brought Japanese-styled battered-then-deep-fried seafood and vegetables to the masses. At the below S$20 per bowl price point however, diners will be hard-pressed to be find pristine Japanese ingredients – be it shrimp, squid, eggplant or mushroom – individually and precisely fried in made-in-Japan oil. The opening of Ippoh Tempura Bar (“Ippoh Singapore”), an offshoot of the 166-year-old Ippoh flagship in Osaka, gives discerning diners reasons to rejoice, not least because of the lighter, more delicate and not-at-all greasy tempura flourishes it brings to the fore with the use of made-in-Japan safflower oil. Occupying a cosy corner next to Candlenut in the newly opened lifestyle cluster by COMO Dempsey, Ippoh Singapore offers just 18 seats (12 at the hinoki-top counter and 6 at a table) in a lofty space surrounded by hanging bamboo fixtures. Featuring imported Japanese ingredients exclusively, the omakase menus are assembled by Masaru Seki, a fifth-generation member of the founding family in Osaka who now helms Ginza Ippoh in Tokyo, and impeccably executed by Japanese chefs Aoki Tomonori and Ishida Takahiro. Each piece of tempura is individually fried in the same safflower oil that is used in both Tokyo and Osaka and served with simple condiments of salt, lemon as well as dipping sauce with freshly grated daikon. Three tempura sets are available at lunch: S$60++ (8 pieces + rice + miso soup), S$80++ (10 pieces + rice + miso soup) and S$100 (11 pieces + rice + miso soup) while dinner is a decidedly more extensive affair starting with omakase offerings of S$140++ (appetizer + 10 pieces +rice and miso soup), S$180++ (appetizer + sashimi + 11 pieces + rice + miso soup) and S$200++ (appetizer + sashimi + 11 pieces + rice with shaved truffle + miso soup). Highlights from the S$200++ 11-piece omakase include shiso leaf-wrapped shrimp and kisu fish as well as Ginza Ippoh’s signature shrimp toast tempura. Unique only to this set is an item available only in Singapore, fried seaweed tempura topped with raw uni, wasabi and caviar. All sets conclude with a bowl of kakiage with rice but the S$200++ set is served with truffle shavings.